Last Friday night Stuart and I went to see The Lehman Trilogy at the Oliver Theatre part of the National Theatre on London's glitzy South Bank. It was over three hours long - but we loved it. Even if it was about bankers. With a cast of just three, playing every character, Stefan Massini's sprawling five-hour long play is about the Lehman brothers and their now infamous corporation. The piece has been adapted and somewhat streamlined (thank goodness) by Ben Power for the National Theatre. Spanning from 1844 to the present day, Sam Mendes directs this American epic about dynasty, greed, and business. It is colossal, absorbing and at times poetic. Massini's original play starts in 1844 and continues until 1984, before the Lehman Brothers' bankruptcy in 2008. Yet in this powerhouse production, the catastrophic consequences of the investment bank's fall act as bookends. The set is the corporation's high-rise office in 2008, with bankers’ boxes on the floor, and remains so for the entire saga, rotating around with a panoramic screen behind indexing different times and places. Highly filmic and with piano accompaniment, Mendes allows history to wash over the almost vacant office, as if it were a magical music box. 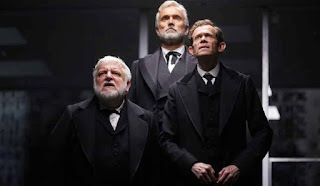 Simon Russell Beale, Ben Miles, and Adam Godley are fantastic as the brothers and their descendants. They speak in third person narrating their characters' lives with almost no dialogue, using repetition effectively although sometimes overly to signify characters. The effect is not particularly theatrical, more like a novel, but the performances are phenomenal. Beale, in particular, is astounding, transforming from Henry to Mayer's wife, to Emanuel's son Philip to Pete Peterson, the first non-Lehman president of the business. While perhaps Miles is the least dexterous at changing characters, the ensemble are crucial to making the epic resonate and all create nuanced and complex characters. Some aspects of the story are glossed over. When Henry (Beale), Emanuel (Miles) and Mayer (Godley) Lehman immigrate to America, their dream of a better life is seemingly celebrated in Power's script, even as they expand in Montgomery, Alabama due to the cotton empire. There are mentions of slavery and the KKK, but the tools of oppression that allow the Lehmans' success are left somewhat peripheral, never explicitly named as enabling their prosperity. That said, as they grow their business from a clothes shop to a broker company, to a bank and then to a corporation, ominous nightmares about trains, weighty burdens, and the tower of Babel consume the family. There is a correlation between the rise of their empire and the loss of their faith. The week long Jewish mourning ritual, Shiva, takes days for Henry, but for the family's descendants takes mere minutes (or none at all). With a powerful climax of the 1929 stock-market crash, that foreshadows the company's fatal destiny; there is a real sense of loss, that something has gone astray. But whether it be the American dream, connections to their homeland, or family identity, exactly what is lost is left unsaid, and deflates what could be a truly profound ending. 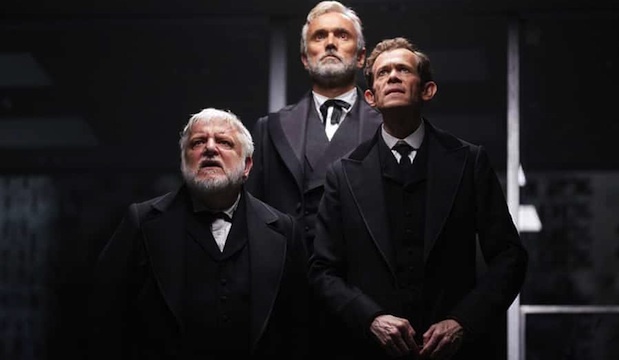 Nevertheless, The Lehman Trilogy is still excellent storytelling, and is certainly a strong addition to the National's programme this year. This is done with two straightforward visual effects. A small space on the stage where vast decisions are made, and beyond that space a world that has to respond to those vast decisions.